Map of Armenia made in order to help the goal to have all the countries of the world in Warlight. 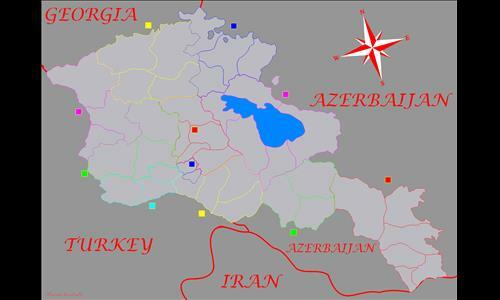 The territories aren't actual distribution, but they're based on the biggest cities of Armenia, with the exception of Yerevan, where the city is split in two territories. I know it's not a very good map, but I hope you enjoy it. Review by NinjaNic on 6/7/2014. Not bad! Although the Syunik bonus should be lowered to 2 or 3 because you only need to defend 1 territory. Otherwise, I like it! Yes, you're right, I thougth about it, but how it is the only bonus with 6 territories I though that it would be a little unfair if you start there and you take the whole of if and you just receive 3. But you are quite right, thanks! Review by 6th Army Group on 8/11/2014. Pretty good map. You can adjust the strategic 1v1 template to it ( remove some wastelands, make them smaller, etc.) and it makes for a good, short game. The only con is that size limits its use to just a 1v1 map.